Originally available in black, the Zune 80GB now also comes in Red, just in time for Valentine's Day, according to Microsoft, and if getting the Red Zune 80GB is not enough, you can also choose to have it laser-engraved and choose from 20 new designs over at ZuneOriginals.net. The featured artwork that can be engraved on your new Red Zune 80GB includes artworks from Colorblok, PSYOP, Friends With You and Studio Play Pretend. These artwork are only available for a limited time, that is, until Feb. 14. 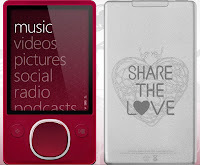 In addition to the laser engraved graphics, you can also choose to add three lines of text and if you're the mushy type, take away the graphics and just engrave a 5 line poem unto your new Red Zune 80GB to give to your sweetheart.